From left to right: Senate EPW Committee Chairman Jim Inhofe (R-Okla.), Senator Tom Carper (D-Del. ), and Ranking Member Barbara Boxer (D-Calif.). The Senate Environment and Public Works (EPW) Committee today approved a six-year, $277 billion reauthorization of the federal highway program. 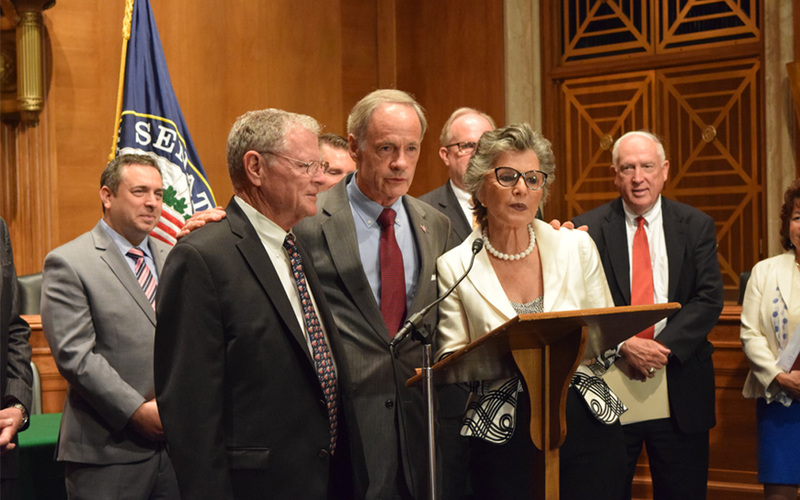 The “Developing a Reliable and Innovative Vision for the Economy Act,” or DRIVE Act, was authored by Committee Chairman James Inhofe (R-Okla.), Ranking Member Barbara Boxer (D-Calif.) and Senators David Vitter (R-La.) and Tom Carper (D-Del.). While members of both parties lauded the bill’s policy reforms and investment levels, Democrats were clear they would like to see even higher investment levels. The measure would ramp up highway investment from $43.1 billion in FY 2016 to $48.3 billion in FY 2021—current highway funding is $40.3 billion. It would provide small funding increases for most existing components of the federal highway program and create two new programs: a $2.2 billion per year National Freight Program and a $400 million per year Assistance for Major Projects Program. The DRIVE Act proposes to invest $20 billion more in highway and highway-related improvements than the six-year reauthorization bill approved by the EPW panel in 2014. The measure also includes a number of provisions to further streamline the federal environmental review and approval process for highway projects. Read ARTBA’s analysis of the proposal. The EPW highway proposal is just one piece of the surface transportation reauthorization plan. The Senate Banking Committee must also produce a reauthorization of the public transportation program and the Commerce Committee will need to develop legislation to reauthorize the transportation safety programs. While the transit and safety measures are not expected to be contentious, the Senate reauthorization process will not move forward until the Finance Committee generates new revenue to both: bridge the gap between incoming Highway Trust Fund (HTF) revenues, and the new investment levels that would be set in the reauthorization process. The EPW Committee’s approval of the DRIVE Act demonstrates once again the broad bipartisan support that exists for federal highway and public transportation investment. The Committee’s action also puts increased pressure on the congressional tax committees to develop a long-term plan to stabilize and grow HTF revenues. All members of Congress need to continue to be pushed to support a permanent trust fund fix that will allow the DRIVE Act and the entire surface transportation reauthorization process to move forward.